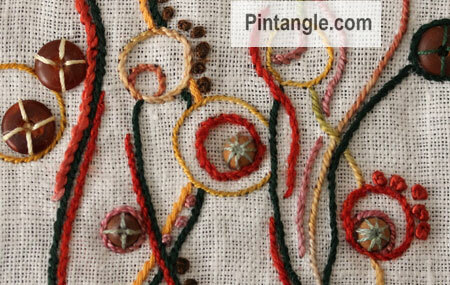 Stem Stitch is considered a basic stitch used most often for stems or organic shapes and floral patterns. You can use it to outline just about anything. It is quick and easy to do, which is always a plus, but most of all it is incredibly useful because it can hold a curve really well. If ever you have any text that is full or curves or something with a tangle of tendrils and flourishes stem stitch is your best choice of the linear stitches. It also looks good in variety of threads. The sample above I used cotton perle #5 and #8, wool, linen and silk. Even though our line will be hidden by your stitching if you need to mark a line use a air dissolvable pen or a quilters pencil. Work from left to right. Bring the thread up from the back of the fabric on the line. With your working thread under your needle, point the needle to the left, pick up a small piece of material to make a small stitch as illustrated. Pull the thread through the fabric. Make the second stitch forward along the line, bringing the needle out a little behind the first stitch. Pull the thread through the fabric. Repeat this along the line. Keep stitches the same length and the tension even. Closely spaced stitches make a tight line, and a looser line is created by lengthening the spacing. If the thread is worked above the needle, the stitch produced is slightly different, and is known as outline stitch. These Stem stitch samples worked on a crazy quilt block are both worked in #5 perle cotton thread. Stem stitch is also known as crewel stitch, stalk stitch and South Kensington stitch. Stem stitch for week 8. 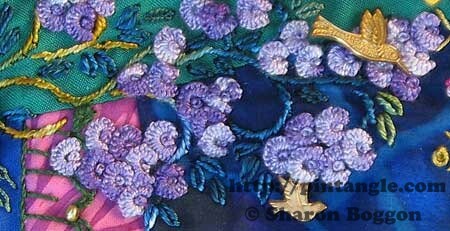 Had a lot of fun stitching “stems” and adding all types of flowers in the mix. My stem stitch has been done onto paper. That is my challenge for TAST. Hello Sharon… here is my blog post about the stem stitch. I really enjoy using this stitch and I loved seeing your examples of it! Beautiful!! I’ve posted my Stem Stitch at my place. Love your examples for this stitch, beautiful. Hi Sharon and all. I decided to have a go (my first time) this week…so here is my entry. It was fun to do! Thanks! I know, this is my second comment! I got a bit carried away and played with another sample today. I got left way behind. I’ve started catching up, details on my blog. Like the new site Sharon! I am still catching up. Here is my sampler. Post also include whipped wheel and barred chain stitch, both also with beaded variations. i’ve left my comment on the main page with the link to my work for week 15. The stem stitch for TAST week 15 is on my blog here. i’m quite late this week but finally have my TAST post up. feel free to come and take a look at how the christmas stockings are coming along. And now my blog has been updated. I posted what I thought was the stem stitch on Flickr and Stitchin Fingers. Will be doing a blog post later. I have posted photos of my stem stitch examples on my flicker site here http://www.flickr.com/photos/susie_w/ This stitch brought back many childhood memories as it was the first stitch I was taught. I smiled as I remembered all the dish towels, pillow cases and blouses I stitched on as a young girl. Nice to know I still find pleasure in stitching. This week, i went on an pilgrimage tour. So i dont find time to stitch stem stitch. I am having a design copied and but not done, will be doing soon. I uploaded my earlier work with styem stitch in the flicker group. Down to the wire again. I found there was lots I didn’t know about stem stitch. I’ve shown some more samples from my archives of stem stitch worked in various styles and in various circumstances. Stem stitch on my blog. The pattern is one of your free patterns! I finally finished my piece! Another embroidered diary entry. This was the first time I actually figured out how and why my stem stitch always looks so terrible, so it’s been fantastic getting to learn the stitch properly. here is my contribution to this page about the stem stitch. Pauline have not finished her embrodery, but I will add it on the same page as soon as she finished it. Lovely stem stitch! It has a nice flow to it and is very relaxing to do. I used the same floral design as last week and I enjoyed comparing the same cherry flowers worked in last week’s satin stitch and this week’s stem stitch. 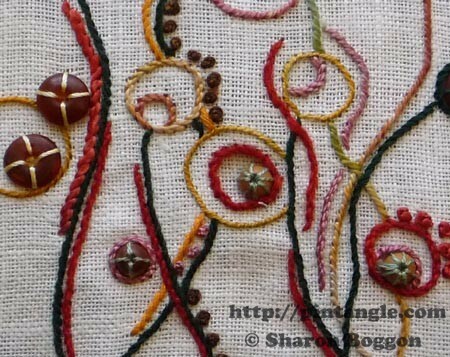 I have put my Stem Stitch example on my Flickr page. I have used stem stitch for fill for a long time, because I can’t do Satin Stitch at all well. Here is my stem stitch sample for this week. Some stem stitches with satin stitch and detached chain stitches! Nice exercice! I have posted the pictures of my old works with stem stitch. I’m looking forward to the more complex stitches! 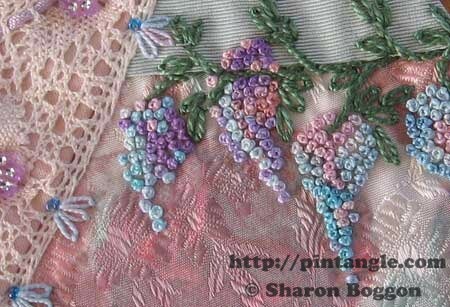 Here come my post for this week’s stitch along with some of my old works. 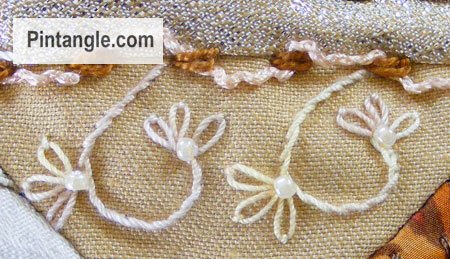 I combined the embroidered stem stitch with flowers made from a variety of papers (pattern-wise and texture). The embroidery is included in my TAST embroidery journal that includes a personal reflection, gratitude list, and college of items that represent the past week. Here is my new entry and an older embroidery. http://christinaroland.blogspot.com/2012/04/tast-week-15.html My weekly sample is finished. I love this stitch, but this sample lacks conviction. Will be continued…. Sharon your samples are gorgeous! I have posted a piece at http://princessbubblescreates.blogspot.ca/ It is a piece I did many years ago. I am glad I was able to find it! I don’t have a lot of spare time for stitching this week as my son is getting married on Sat. I hope to find some time to stitch something new too.